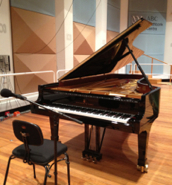 Classic FM conducts a live performance every Sunday afternoon at 3pm, and this month it broadcasts from SouthBank in Melbourne. A collection of nocturnal pieces with moonlit connections was today's theme, presented by Colin Fox, a familiar voice on radio. Pianist Caroline Almonte performed wonderful pieces that include Beethoven's Sonata No. 14 in C sharp minor, Debussy's Clair de Lune and Chopin's Nocturne Op 27 No. 2. I'm always in awe watching pianist's fingers jumping and floating on piano. It really looks like a magic.